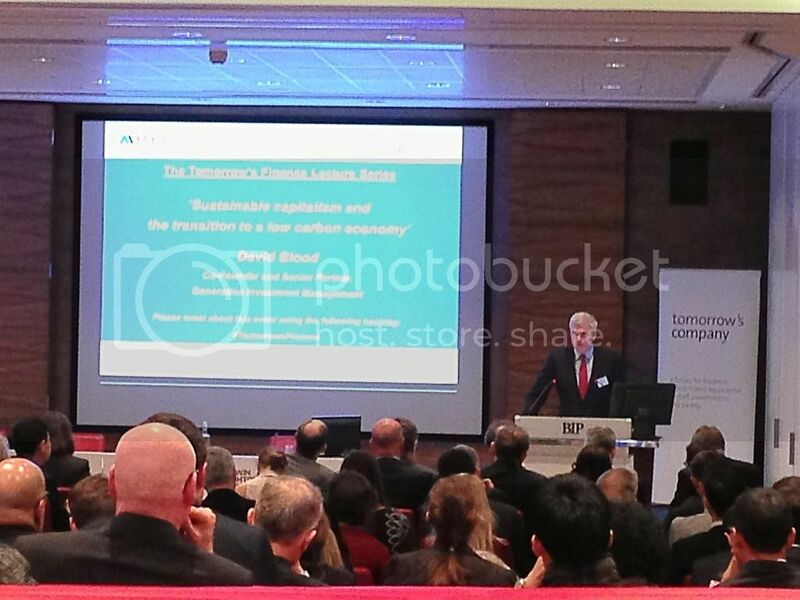 David Blood, co-founder and senior partner of Generation Investment Management (GIM), delivered a lecture at the Tomorrow’s Finance event held at Berwin Leighton Paisner on the 27th February 2013. Sitting on the business panel were Nick Robins, Head of the Climate Change Centre for Excellence, HSBC; Steve Waygood, Chief Responsible Investment Officer, Aviva Investors and Gervais Williams, Managing Director, Miton Group plc and author of Slow Finance. The Tomorrow’s Finance Lecture series is a joint initiative ran by Tomorrow’s Company and Miton Group plc. Past lectures have featured Gervais Williams, James Featherby(Chairman, Church of England Ethical Investment Advisory Group), David-Pitt Watson, Professor John Kay and Matthew Bishop (US Business Editor and New York Bureau Chief, The Economist). The lecture series is inviting some of the most senior and thoughtful figures from and about finance to consider what is the purpose of finance and is the finance sector fit for purpose? David spoke of the need to accelerate the rate at which we transition to a low-carbon economy and sustainable capitalism. He acknowledged that the world has come a long way in ten years but we are not evolving fast enough to be prepared for 2025. The ten suggestions to ‘achieving sustainable capitalism by 2020’ in GIM’s white paper are a good starting point but there is need to go beyond them and implement radical and courageous changes. He concluded his speech with four points which set the stage for the panel discussion. The inaction on the climate crisis is directly linked to the inadequacies of capitalism. There is a fundamental need for society and the planet to make capitalism more long-term, responsible and sustainable. The view that we cannot afford to take action of climate change is misguided. Critically, in a post-crisis economy, if we do not understand the real price of carbon we will continue to inefficiently allocate capital. There are lucrative opportunities addressing climate change that are not related to subsidiaries and are simply smart business decisions. The cost of inaction is far too significant to ignore. Ultimately, Mother Nature does not do bailouts. The conversation at the event was exceptional. The speakers provided interesting provocations and perspectives while the audience asked thought provoking questions which were aptly answered. Here are the highlights from the discussion. The concern for stranded assets is clear and investors have presented the case for this systemic risk to the Bank of England. The challenge now is figuring out what we can do. The IEA reported that “no more than one-third of proven reserves of fossil fuels can be consumed prior to 2050 if the world is to achieve the 2C goal”. Nick Robins said that although progress has been extraordinary, most portfolios are set for a 4C world. He added that throughout all periods of economic transition, assets get stranded. It is our challenge to minimise the financial and human damage from this transition. Pension funds are already grappling with the stewardship challenge of steering their investment away from this profound shock. Aviva Investors are working with Oxford University to look at all the assets in their £260bn portfolio to find out which assets are at risk of being stranded. Fatih Birol, IEA’s chief economist said last month that the prices of oil are harming Europe which will need to spend 500 billion euros on oil imports this year. The costs of a reliance on oil can hold back economic recovery. Gervais Williams argued that as practicing fund manager, he found that although the business case is clear, businesses are overwhelmed by other factors. In particular, debt and the scale of debt are significant barriers. The need to address debt over all other concerns holds back the ability of businesses to take action. Debt is not only a constraint for corporations; it is also an issue for governments. Gervais commented that as financial markets have become more sophisticated, they have become more product-orientated. The growth in derivatives, ETFs and different indexation reflects this biased growth which disconnects investment going in and the underlying purpose of that investment. Nick mentioned the Bloomberg New Energy Finance white paper which identifies areas in which regulation of investment may be holding back investment into clean energy and green infrastructure. The conflicting fiduciary duty of asset managers and owners was discussed. There is a short-term obligation to clients to deliver returns at a quarterly basis. However, in the long-term there is responsibility to pensioners, the environment and next generations that can only be achieved by understanding the true risk of your portfolio. However, other issues remain such as the mandate which usually focuses on beating benchmarks and considering a risk budget which may not be helpful as renewable energy investments are quite volatile. These mandates often mean that it is difficult or impossible to divest away from the oil and gas industry. Companies are ahead of asset managers and asset owners when acting on climate mitigation. A carbon reduction target for institutional investors was suggested as a way to reduce the carbon intensity of portfolios. Steve quoted the Stern Review on the Economics of Climate Change which stated that “climate change is the greatest and widest-ranging market failure ever seen”. It is the government’s role to correct market failure through fiscal policy or even regulation. He added that the current international governance structure is not fit for purpose. One significant barrier stopping the UN from collaborating on this issue is the large amount of lobbying done by vested interest groups. He suggested that there should be transparency on what companies are lobbying for. Alongside the emerging countries of China, India and Indonesia, Obama’s pledge to address the challenges of climate change suggests that the next few years may involve interesting intervention by big governments steering us towards action. However, it was felt that a carbon tax in the USA was still not very likely. Although it was agreed that now is the time to take serious action and move towards a low-carbon economy (which does not just include reducing carbon but also considering how we protect food and water for the long-term) the audience felt that this was an issue that will particularly affect the next generations. David mentioned Bill McKibben’s article in Rolling Stone magazine which led to the ‘Do the Math Tour’ last year. Unprecedently, over 100 colleges and universities in the US joined this campaign, where students called for their University’s funds to divest from the fossil fuel industry, signalling that younger generations are beginning to take a stand.